We offer our clients with solar blinkers that are the LED based Solar Blinker Unit. They have blinking cycle of Blinking mode 1 sec & Off mode for 1 sec. They are generally used as a symbol of some warning. This blinkers are available in Amber, Red color. 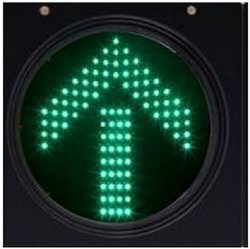 Green Blinking Arrow signal is rarely used. This Solar Road Safety Warning Blinker uses solar energy to operate the signal. So there is no need of Electricity supply. 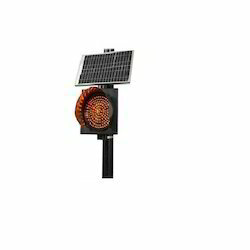 We are engaged in offering a Solar Powered Amber Traffic Signals Blinker. Manufactured using a superior quality raw material, these Amber Traffic blinker signals are known for their uninterrupted operations and self-generated power. Owing to their microcontroller based charge regulator and solar panel assembly, these Amber Blinker are widely demanded by the clients. application Road Divider, Under-construction Sites & Police Barrier. 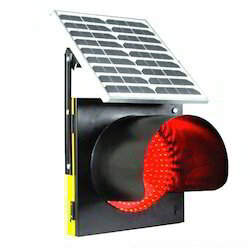 We are engaged in offering a Solar Red Blinker. Manufactured using the superior quality raw material, these Amber Traffic blinker signals are known for their uninterrupted operations and self-generated power. Single / Double / Triple Aspect Model. Fine control over the operation of system, panel, blinking, battery etc. CCU – Avoid Reverse flow of current to Solar Panel.